Our self-colour steel weld mesh sheets are usually supplied with a thin copper-washed coating that provides provides minimal early corrosion resistance and is used as a catalyst during any further welding process. Use for security cages, gabions, dog runs, retail hanging displays, ceilings and in bars and restaurants. Available in 2x2" (50x50mm) and 1x1" (25x25mm) square mesh apertures. 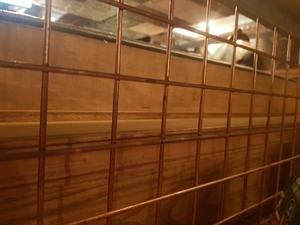 The mesh can be painted and welded as they are not galvanised. Steel welded wire mesh are supplied as "self-colour" which means they are not galvanised and are therefore suitable for welding painting or further treatment. Our standard range of mesh panels is manufactured from 3mm thick wire (10swg) and available on 8ft x 4ft panels and 6ft x 3ft panels.